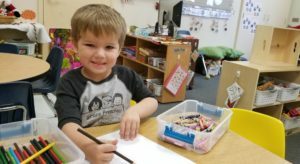 Grace Preschool holds open enrollment each year in February. Current Grace Preschool families and active GUMC members have the opportunity to submit registration packets first, for the upcoming fall session. Then it opens to the waitlist, then public. If your desired spot is confirmed, a registration packet will be given. There is a non-refundable $225.00 fee for the first child; $175.00 for each additional child due WITH completed registration form(s). Once those are received by our administration team, your family is officially enrolled! Welcome to the Grace Preschool family! Registration for Fall 2019/2020 School Year will begin in February, 2019. February 4th – Packets go out to current students, siblings and active church members. Monday, February 25th – Packets available for wait list families should any openings remain. Then open to the public. Move to the area mid year? Periodically we will have a spot open up throughout the school year. Call us to see if we have an opening and we will do our best to accomodate your family! We can also refer you to another wonderful school in our network.